This cute pop-up Christmas card is the perfect way to spread some Christmas magic! 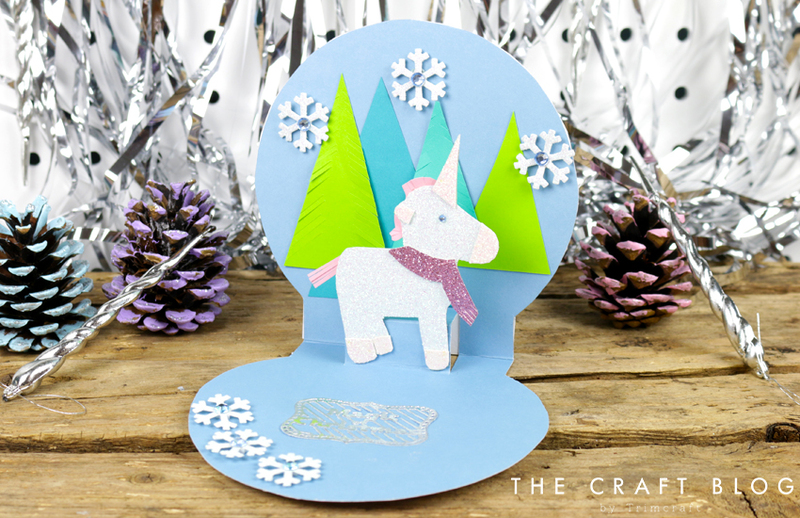 The snow globe-shaped card folds out to reveal a sparkly festive unicorn hiding inside. Read Maxine’s step by step tutorial to see how easy it is to create this pop up card – we’ve also provided a free template for the perfect card shape. Download your free template here. Cut out your free card shape and unicorn templates. Draw around the free template onto the card blank and cut the shape. Top tip: Turn the card blank inside out to create a coloured inside. 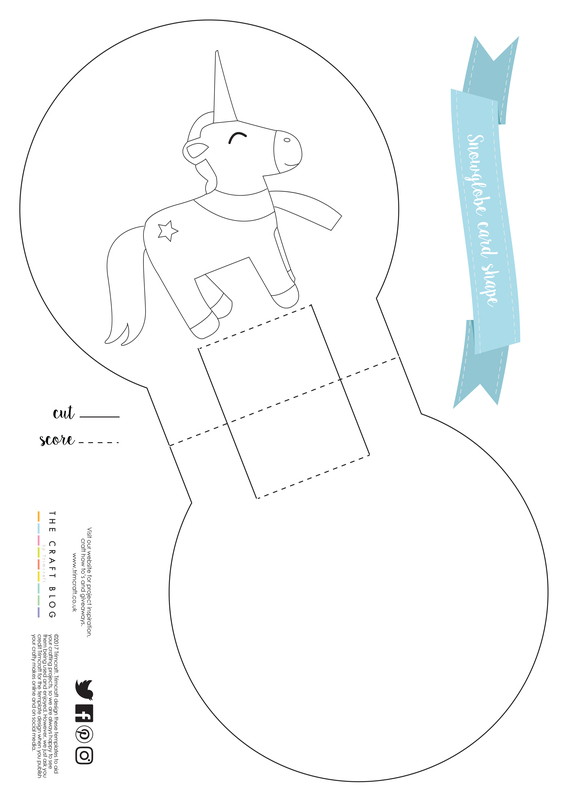 Cut out the unicorn template and pieces of glittered card stock to build up the unicorn. We used the template to make the scarf, star, tail, mane and other features from the card stock. We also used an adhesive gem to add some sparkle to the unicorn’s eye! Cut four different triangles of various sizes out of card stock to fit to the back of the card blank space. We fringe cut along two edges of two of the triangles to give the impression of trees. Adhere these to the back of the card. Adhere the unicorn to the cut pop-up stand at the back of the card. Die cut the sentiment and snowflakes and adhere these to the inside of the card blank. Add gems to the centre of the snowflakes. Adhere a piece of festive paper to the front of the card and cut around it to follow the snow globe shape. Die cut another sentiment and adhere this to the front of the card to finish – we used the “’Tis the Season” sentiment from the First Edition Christmas Sentiments dies. We think this pop-up card is super cute! Decorated with Christmas die cut sentiments, glittery embellishments and with shiny foiled paper, this card is full of festive sparkle! This would also be a great craft to get children involved with too, as they can have fun styling the unicorn with different accessories! We would love to see your versions of this card so remember to upload them to the Inspiration area and to #trimcraft when uploading to social media.